You are sitting two stories up with 80,000 pounds of raw power under your seat jamming the gears of your rig and master of all you see on the endless road ahead. You are the Highway King and when you are looking for a mobile slots game to play your game is Highway Kings from Playtech. 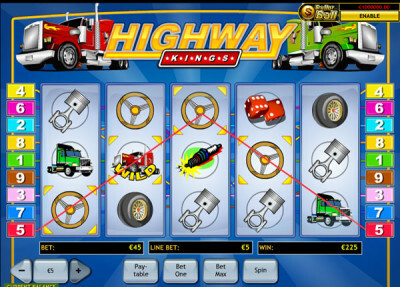 Highway Kings is a five-reel slots game with nine lanes to prizes. The toll to play is only 0.01 coins so you can cover the entire road with just 0.09 coins. When you are feeling flush with your payload delivered you can risk up to 1.00 coin per line for a maximum bet of 9.00 coins. There is no progressive jackpot but you can hitch up to la oad of 180,000 coins to haul on the homebound run. There is a Max Bet option and an Auto Play button so you never need to take your eyes off the prize as you barrel down the highway. Playtech has created a game for the concrete cowboys but has not provided the necessary regal accessories to honour the true highway kings. The clip art of the steering wheel, 23-inch tractor tires, silencer and spark plug certainly took less time to find than it takes to fill up the tank of a semi. With their brain power fried from exhaust fumes the game creators ran out of ideas for images of the trucking experience and so give Highway Kings a petrol can and a petrol pump. They could not even come up with a good pair of fuzzy dice to hang from the rear-view mirror, just a regular pair of bones. For the major symbols there are three identical trucks just painted different colours – perhaps the Highway Kings was simply a drag race to see how fast a slots game could be cobbled together. The rules of the road are as simple as you will find in the mobile slots universe. All you are required to know is that matching symbols equal cash prizes. There are no bonus games or free spins or anything to muddle your attention behind the wheel of the big rigs. The star of the road is the Red Truck that is a rare enough sight on the road that even when it shows up just once you double your staked bet. If an entire convoy of Red Trucks appear along a single payline the return is 10,000X your bet. You can score even bigger if a Wild Red Truck is involved in the win. You will know this special Red Truck because “Wild” is written on it. Every time the Wild Red Truck rolls onto the reels it will double all prizes it helps create. So if one of your five Red Trucks is a Wild one you can claim the top in-game jackpot of 20,000X your wager. Only look for the Wild Red Truck in the three centre lanes. The Highway Kings Scatter is the Silencer where you might ordinarily expect a roaring V-8 engine or something. Perhaps the clip art budget was exhausted by then. The Silencer awards nothing but a modest multiplier of your stake. It starts with two anywhere on the reels which returns your original money. Five Silencers will quietly deliver 100X your stake. And Highway Kings rule the road in Europe and the Americas – wins are paid on both sides of the road, from left to right and right left. Vroom, vroom.